We love seeing a custom sticker and some creative placement make a buzz on the Internet! 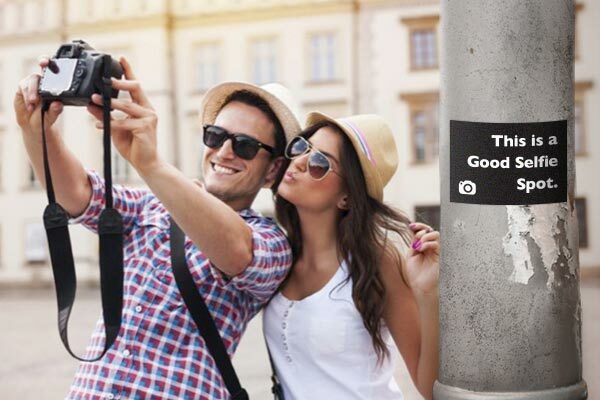 If you're a world traveler, you may have unknowingly come across one of our favorite examples of this: The Good Kiss Spot Sticker. This sticker was originally created by Italian street artists 0707 (Zerosette Zerosette), a group dedicated to humanizing urban spaces. The sticker design is simple, a black square with white text. Nothing too outlandish or prominent, just bold enough to catch the attention of passersby. It is the message of the sticker that sticks, giving direction to all nearby that this is a prime location to move in for that smooch. The sticker has been spotted in tourist locations all over the world, from New York, to Rome, to Sydney. Near any place with a great view, romantic lighting, or historical significance, don't be surprised to find the sticker slapped up nearby. This expedition to mark the world's best places to kiss was opened up to the public and anyone who was willing to spread the sticker art. A Facebook page was created inviting volunteers to participate in the sticker street art. Those who expressed an interest in helping out were sent stickers to slap up in romantic locations during their travels or in their own communities. The stickers can now be found in nearly every country worldwide. The same art group also posted several other custom stickers with encouraging messages such as, "this would be a nice place to start a conversation with a stranger". Yet another important message! As fans of this creative movement, and as connoisseurs of sticker art, StickerYou encourages everyone to label their favorite romantic locations. You can follow 0707 and the Good Kiss Spot sticker spread on Instagram by using the #thisisagoodkissspot hashtag.